After months of being unsure as to whether or not it’s appropriate to wear your favorite white outfit, now’s your chance. With Memorial Day coming up, Vogue Knitting’s Spring/Summer edition has a fashion preview with beautiful white knits perfect for the summer months. Whether you’re headed to the beach or staying at home, take a look at some of these high-fashion knits and maybe try one on your own! A few weeks ago, The Arizona Republic covered a story about how cancer survivors have found a connection between stress relief and knitting. The story follows Katherine DeSantis, a Phoenix resident, who underwent surgery for breast cancer just two weeks earlier. Since her surgery, DeSantis has joined a knitting group at the Phoenix Wellness Community that provides activities with fellow cancer survivors, their families and friends. Joining this knitting group has already had a positive impact on her life, giving her something to focus on besides her upcoming treatments. At the first meeting, nearly 20 people gathered for what was originally designed to be a monthly get together. After the big turn out, organizers decided to offer the free knitting sessions every two weeks. DeSantis first learned to knit when she was a young girl and still has the knitting needles that her late grandmother used to use. 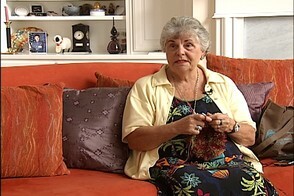 Despite not having picked up a knitting needle in a number of years, DeSantis’ hands quickly took over for her and the stitches came naturally to her again. Still need a gift for Mother’s Day? Mother’s Day is right around the corner and if you’re still trying to think of good gift ideas, why not try sitting down and knitting her something. One great idea to make for your mom, grandma, mother-in-law, or whoever you wish to celebrate on this special day, is the Loop Washcloth. While a washcloth may not seem like the most exciting gift, you can pair it with a basket of nice bath or shower products. Making the Loop Stitch can be a little tedious, but once you finish, this washcloth will be a great addition to anyones home spa collection! 20 stitches and 32 rows per 4 inches (5 stitches and 8 rows per inch) in pattern. Gauge is not critical. Finished size is 9.5 inches wide and 10 inches long. On the next row (wrong side), make the loop stitch: Hold the yarn over your index finger and wrap the yarn around your middle finger, forming a loop around the middle finger. 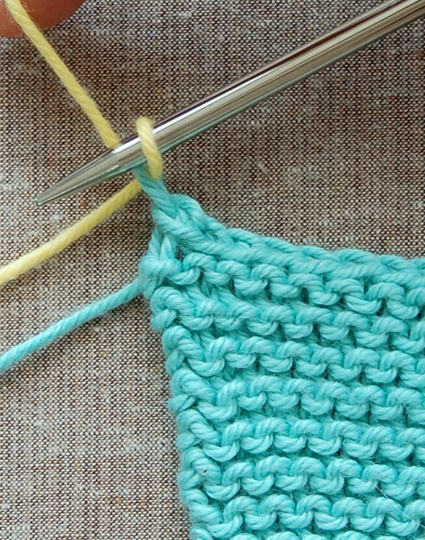 Knit the first stitch, but don’t take it off the needle. Slide the new stitch to the left hand needle and knit along with the old stitch, through the back loop. Continue across the row. On the next row, knit every stitch through the back loop. Repeat these six rows for pattern, continuing until the work is almost 10 inches long. Bind off after completing a row of loops and the knit through the back loop row.